Monty Python and The Holy Grail has been named by film fans as the best British picture of all time. It comfortably beat Stanley Kubrick's controversial film A Clockwork Orange into second place. The survey, by the UK arm of Amazon and the Internet Movie Database, was a mix of classics and more recent releases like 1998's Shakespeare In Love. 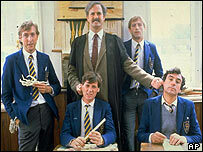 Monty Python's other well-loved comedy film, the Life of Brian (1979), came seventh in the list. The oldest film which made the top 10 was spy classic The Third Man (1949), while recent romantic comedy Love Actually was highly esteemed. Another film from the Richard Curtis stall, Four Weddings And A Funeral, landed at 12. Monty Python's 1975 winner, a comic take on the mythical search for the Holy Grail, captured a quarter of votes from 7,000 film fans who took part in the poll. Kubrick's A Clockwork Orange, originally released in 1972, was considered too violent to be seen on mainstream television until 2001. But it was acclaimed by critics and bagged a total of four Oscar nominations. Other Oscar hits which soared into the top 20 included Chariots of Fire (1982), The English Patient (1996) and Gandhi (1982). But there was only one film from the quintessentially British Bond series, Goldfinger, which was made in 1964. Withnail And I, a film which has attracted a cult following since it was made in 1987, sneaked into the list at number 20. The survey was conducted to coincide with the Bafta film awards, which are taking place in London on Sunday.